Saturdays and Sundays are meant for eating yummy food and I woke up this morning to a request from my man to make my Stuffed Portobello Mushrooms. There is something special about cooking something for someone you love and with the day off, I was determined to make it great. Now with this recipe comes honesty. I am queen of winging this dish and I don’t have an exact recipe so I’ll write it down the best I can so you too can try it. Also, I made way to much sauce so I can have it later on some pasta. Yum #CARBLIFE! This is a very easy dish to eyeball and it’s pretty eat to figure out how much you will need of everything based on how many mushrooms you’re making. In a sauce pan add your crushed tomatoes, 2 minced garlic cloves, a tablespoon of tomato paste, and a table spoon of smoked olive oil. Bring to a simmer and add 1 bay leaf, a sprig of thyme, rosemary, and hot and spicy oregano (which I so proudly got from my garden). Add fresh cracked black pepper and salt. Let sit as long as you like on low heat. I left mine for about 2 hours. The more it cooks the better it gets and the better your house will smell. Happiness can seriously be chalked up to the smell of garlic and tomatoes cooking in the kitchen. Maybe that’s the Italian in me but whatever! Start your onions and spinach about 25 minutes before you are ready to eat. In a separate pan add 1 chopped sweet onion to some olive oil and let them start to caramelize. Then add your spinach. Now, I’m honestly not that into spinach so I only add a little but you can add as much as you like. The spinach will cook down and wilt so don’t be afraid if the pan starts out extremely full. Once done add to a small bowl and cover. Heat up a cast iron skillet or grill pan and add a little olive oil. Clean and prep your mushrooms. I like to scrape out the gills….they freak me out. Add to the hot skillet and cook for about 10 min a side or until the mushrooms feel tender. Rinse the pan you used for the spinach and onions and add a bit of olive oil. 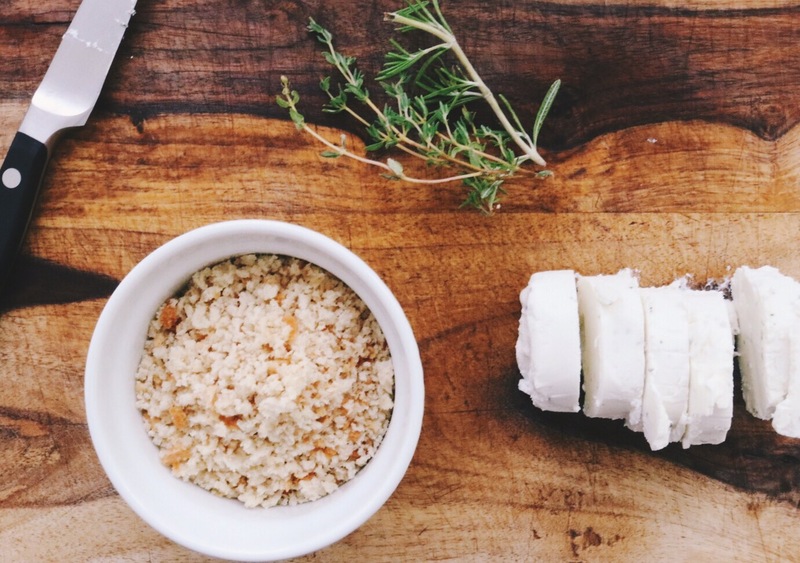 Slice your goat cheese and dip into the bread crumbs. Toast on either side for a few minutes until the bread crumbs become golden brown. Once your mushrooms are ready, pile on the sauce, sautéed onions and spinach, the crispy goat cheese and POW. Lunch is served, not to mention it looks so fabulous. 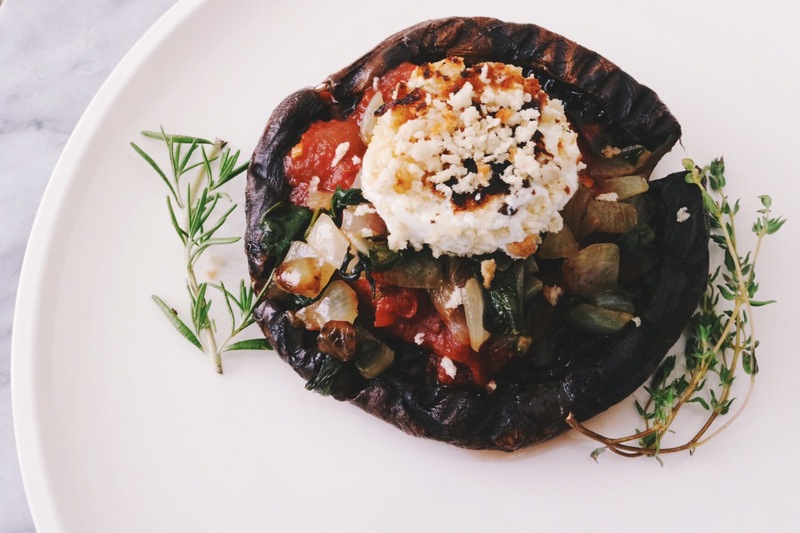 Let me know in the comments below if you try this recipe and let me know your favorite way to stuff mushrooms!